Does Anyone Know What Insurance Is Anymore? 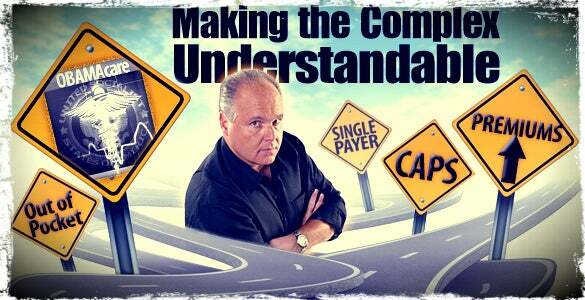 RUSH: The Republican health care plan, we’re gonna get to that, too. Again, just to repeat, first glance at this, I’m scratching my head and saying, “Does anybody not know what insurance is anymore? This isn’t insurance!” That’s what health care, Obamacare and all of this stuff supposedly is about is helping people afford insurance, right? There’s nothing about insurance in this. It just looks like we’re finding ways for everybody to be able to cover every medical expense they’ve got. And, if they can’t afford it, we’ll find a way to subsidize it. It’s asinine. RUSH: There are, of course, other things such as the Republican release or unveiling of their Obamacare repeal-and-replace plan yesterday. And it’s deep. You know, it’s esoteric. It’s so complicated that that alone raises red flags. I know President Trump has tweeted about it today, and I want to share the tweet with you. “Don’t worry. Getting rid of state lines which will promote competition will be in phase 2 and phase 3 of our health care rollout. Don’t worry.” Okay. So we’re supposed to say this is phase 1. There may not be everything you want in it, but don’t sweat it, it’s coming. And he’s intent. He’s been on this since he got into the campaign, and that is eliminating the restriction on insurance companies from selling across state lines, which would be a great thing if they’d put it in there. Right now insurance companies can only sell in certain states and sometimes there’s only one insurance company left in a state selling health insurance, so there’s no competition whatsoever. But that, folks, is way down the list here. That should have been in any repeal and replace, but I tell you what’s missing here. And it’s such a sad thing. What’s missing here is the Republican Party doesn’t seem to want to trust the market. In what appears to be the case — and I largely believe this is because of what Republican donors want. Sadly, this is a fact of life. They want health care to be an entitlement. There’s obviously much financial benefit to somebody or a series of somebodies, if there are aspects of American health care that feature entitlements. But the first thing I notice about this is that it isn’t insurance. I remember when this all started. When I first became aware that it was a big thing to people. Now, you would think my instincts would have me aware of this from the get-go. But I’ve always bought my own. I guess I’ve been fortunate. And I don’t use it. I’ve been very fortunate on sicknesses and illnesses and so forth. I remember I was in Missouri, I was in Cape Girardeau, my hometown, on a vacation to see the family and I went out at lunchtime one day to a restaurant with a bunch of my brother’s friends. They were all business owners and they were just bellyaching and whining about how much it cost them to provide health insurance for their employees. Folks, this is gonna be 1990, 1991. And they’re beside themselves. It’s destroying their businesses. They can’t afford it as it was required by law. They can’t afford what their employees expected and stay in business. And something had to be done. This is right on the verge of Clinton being elected and here came Obamacare one, which was called Hillarycare, which we succeeded in beating back and preventing, if you’ll recall by really destroying Hillary’s nationwide bus tour. He-he-he-he-he-he-he-he. Remember that, Mr. Snerdley? She started in Seattle, she was gonna end up in Washington. We had it so that at every stop there were 20 times as many protesters as there were supporters. So they had to change the route of the bus, go places that were not announced. It was called the Health Care Express. We proved that we can do the civil disobedience thing. Well, no, they can afford that, but they don’t want to pay it. 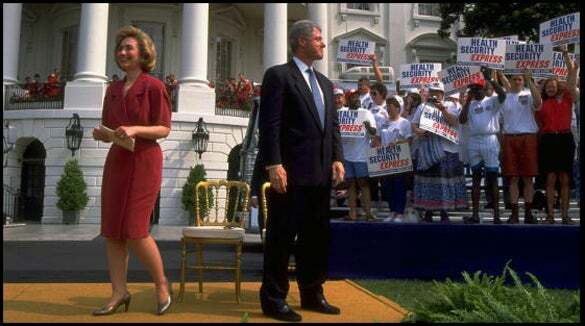 This was shortly after a Democrat senator by the name of Harris Wofford from Pennsylvania — this is prior to the Democrat convention in 1992 — came out and said, “If the Constitution of the United States provides you a lawyer when you can’t afford one, then why the hell doesn’t the United States provide you a doctor when you can’t afford one?” And that’s all she wrote. That got picked up, everybody thought that was brilliant, and so it became almost an assumption, contention, and an assumed right that health care paid for by somebody else should be part of the American way of life. And the first stage of payment in health care is insurance. The other phase of expense is, of course, the actual care and treatment. And then that varies. You have the elective trip to the doctor, but then malpractice insurance got so unwieldy that doctors started testing people for everything under the sun, even when they knew there wasn’t any reason to just to cover against a malpractice suit. So people started getting more health care than they actually asked for or needed, again, as a defensive measure against lawsuits. So you can’t throw the tort bar out of this equation. But it quickly hit me, and I was late to the table on this. I realized when I immediately started studying it, the primary problem with American health care was that government getting involved in it, Medicare, Medicaid, 1965, destroyed the entire concept of market forces determining the cost of services and products based on what people can afford. Most everything else in our life is priced on what people can afford to pay for it. I like to use the example of hotels. If you don’t want to spend much, you can go to a Motel 6 or some equivalent. If you want to go whole hog you can find some luxury place that will charge you $20,000 a night. But whatever you choose, there’s no insurance for it; you just choose what you want, what you can afford, or what you are willing to pay for it, and that’s the market providing options and incentives. And as long as there are people willing to spend X, if enough people want it, it’ll be provided. Have you ever wondered why — if I may make a diversion here to explain the point of markets. Have you ever wondered why, in the aviation business, since the first Boeing 707 flew on commercial flights — we’re going back to the fifties and sixties for this — have you ever wondered why, outside of the Concorde, we don’t fly any faster today than we did when jet commercial travel began? The average speed of your average airliner today is gonna be between 500 and 550 miles an hour. Not knots. It would be in the upper 400 knots range. I’m talking miles per hour, ground speed. I’m not factoring winds. The engines that have been developed, that’s the speed. Why don’t we travel, why don’t we have the ability to travel at 700? You know, the speed of sound is 760. Why don’t we fly at 700 miles an hour? Why isn’t that option out there? Why can’t we fly a thousand miles an hour? Are there enough people that would pay what it costs? Well, it turns out no. ‘Cause it turns out in travel, the cost is a much more important factor than speed. And the thing about air travel is also physics. The faster you fly, the more fuel is required. Now, that may sound like it’s common sense. But the reason for that is not just thrust. Is the reason is the faster you go, the greater amount of air you have to fly through and displace. And that air is resistance, whether there’s a headwind or not. And the faster you go, the more power you use in your jet engines, the more resistance there is. And so it has been established by the people in the business that the most effective speeds at cruising altitude for efficiency and economics is 500 to 550 miles an hour. At that speed, at that usage of fuel, that usage of thrust you can price various seats on an airliner from the lowest coach fare up to the highest first class, and the airline can theoretically on a full flight make a profit on that flight. And they reduce it to how much it costs per seat to buy the airplane, not to make the trip. So if an airplane costs a hundred million dollars or 150 million, the way they amortize it is to figure out how many trips at full capacity with an average price does it take to pay for that plane, not how much are we spending per trip. And it’s just been decided market forces have mandated that 500 to 550 miles an hour is it. Any faster and the costs expand incredibly. You wouldn’t believe it. Do you know when the Concorde was still flying — it was shelved in 2003 — do you know what it cost when that plane was shut down to fly one way New York to London or Paris? It was $10,000. Do you know what the seats in the Concorde were? They were coach seats. It was a small airplane. There was no luxury in that airplane. The only reason to fly the Concorde was if you wanted to get there in three hours instead of eight. But they couldn’t find enough people willing to spend — at one time it was $7500 one way. They couldn’t find enough people to spend 10 grand to save five hours on the trip. So the way the commercial airlines do it, if you’ll notice when you go to London or Paris, you’ll depart at seven, eight, or nine p.m. at night, and you’ll sleep overnight like you normally would, and the plane arrives in the morning in London or Paris, which you would normally be getting up at about that time. You spend most of this time theoretically asleep, so you’re not aware of the time passing. And people have shown they’d much rather pay a much more economical fare and spend eight hours getting there than spend $10,000 and get there in three hours. Now, the ability to fly 1200 miles an hour, we have it. The ability to fly 800 miles, we have it. It’s just it’s not economically feasible. Now, what if there were speed insurance available? What if you wanted to fly to London in three hours and you demanded it, but you could only afford a fare of $1,500, and you demand the government make up the other $8,500? What do you think people would say? “Screw you! I’m not paying to subsidize you just ’cause you want…” Well, this is what’s happened to health care. Now, I’m not comparing the necessity of health care to flight. I’m talking about market economics here. There is very little in health care that is priced anymore based on what a consumer or patient can actually afford. Now, if you have a catastrophic disease, nobody is saying that you ought to be able to afford that. That’s what the insurance ought to be for. The insurance ought to be for what you can’t afford, like when you have fire insurance in your house. You are hoping it never happens. But if it does, and your house is destroyed, you don’t have to ability to pay it. That’s what the insurance is for, and that’s the bet that you make. It’s a bet. You’re wagering that your house is not gonna go up in flames, and that’s what you’re paying for: coverage if it does. Same thing with a catastrophic illness. If you come down with a terminal illness or you’re in an accident and the health care that you need is prolonged and expensive, no way does anybody expect you ought to be able to pay that. 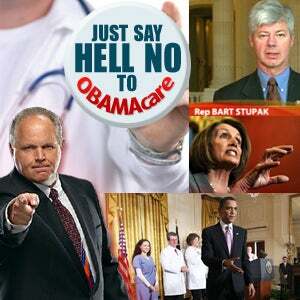 But you ought to be able, if you need to go to doctor for a checkup, damn it, to pay for it. But those days are gone because now people think that whatever is related to their health, that somebody else should pay for it because health is sacred and there ought be no class or economic differences in health because we’re all human beings and illnesses don’t discriminate, and you know the drill. So what’s been accepted is that nobody should have to pay for their health care. It’s just how our system has evolved, and so markets are not trusted, markets are not depended on, even by the supposed free-market Republican Party. Instead, now it’s all political and people think that (stammering), “Well, I — I — I — I shouldn’t have to spend my money on health care! I — I should be able to go out and buy something else with it,” and that’s where we are. After years and years, decades of the American people population being… I don’t want to say “programmed.” It’s become accustomed to the accepted reality that somebody else is gonna pay for your health care, when in fact nobody really pays; you always end up paying in ways you may not ever see. You may not write the check or give the credit card, but you end up paying for it one way — high tax rate, any number of things. So I was hoping at some point that an Obamacare repeal and replace would really feature an attempt to return to market economics in those aspects of health care — not insurance, health treatment — that make sense. And that the health insurance would be for those things that it would be totally unreasonable to expect most people to be able to afford. That’s why you have insurance on other things. And the premise of Obamacare and Hillarycare was that you young people who are healthy and don’t get sick and you’re not even thinking about long-term illness and death, you should be paying the freight for Aunt Emma over here who is in her eighties and can’t afford it. And you’re saying, “I don’t want to pay for somebody’s Aunt Emma! I don’t want to pay for any of it until I get sick.” That’s too bad, because Obamacare means — if it worked as designed — you’d be paying 80% of all this, or 50. As long as emergency rooms in America have to take everybody, you can kiss profit good-bye. It’s all out of whack, and the fact that every aspect of health care is presumed to be covered by insurance, we don’t have a prayer of ever fixing this. The market will fix it, but we don’t have enough people that trust it, and the reason for that is education. The American education system has literally corrupted the minds of two generations of Americans on capitalism and free markets. RUSH: Let me ask you about your home insurance, another question about your home insurance. Let’s say you like scented candles in your home because maybe your dog stinks, other family members stink, or there are just household aromas you don’t like. So you like scented candles but now it’s time to leave house. Maybe you’re gonna go to the movie, maybe you’re gonna go somewhere. Do you leave the candles burning or blow ’em out? (interruption) Why? Why do you blow ’em out? You blow ’em out because of the risk of fire, right? You have a smoke alarm in your house. Many of them, depending on how would your house is, require them. Do you can’t move in or buy one without one. Do you make sure it’s working? Why? “Well, I want smoke alarm. I want to be able to get out of there if there’s a fire.” Exactly. Look at what you have to do in order to get homeowner’s and fire insurance, and if you didn’t blow that candles out and your house caught fire because of the candle, they might accuse you of arson and they wouldn’t pay off. You know that, so you may… Why isn’t any of this stuff applicable in health insurance? Well, we know the answer to that. It’s because it’s been turned into an entitlement because the people behind it want it to be something over which they have control of people. But we’re never gonna fix it. You know our “white comedian,” Paul Shanklin, who does many of our parodies? He sent me a copy of a bill for a family of… Let’s see… Father, mother… Four people, family of four — 36-year-old father, 34-year-old mother, the kids are ages two and six — in 1999, and it is a bill, and the premium is $145. And let’s see… Let’s see the health insurance cost. I don’t know if it’s monthly or for the year, but it’s 1999, and if you remember 1999, everybody was complaining about the cost of health care then. Outrageous! It was $145. I really can’t tell if this is a month or a year. The deductible is $4,500. So I’m gonna assume this is a monthly $145. Anyway, you know what it is now? It’s $1,400 for the exact health care plan as 1999. Now, admittedly that’s 18 years ago. A long time. But back in 1999, everybody was complaining about how much it cost then, and look what’s happened. 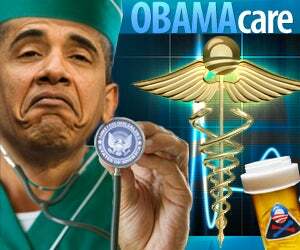 With Obamacare and all kinds of attempts to fix it, look what happened! It’s the same thing that’s happened when the government gets involved in “fixing” your cable bill. What happens to your cable bill? It skyrockets. So 145 bucks a month versus $1,400 a month today for the exact same health insurance policy.